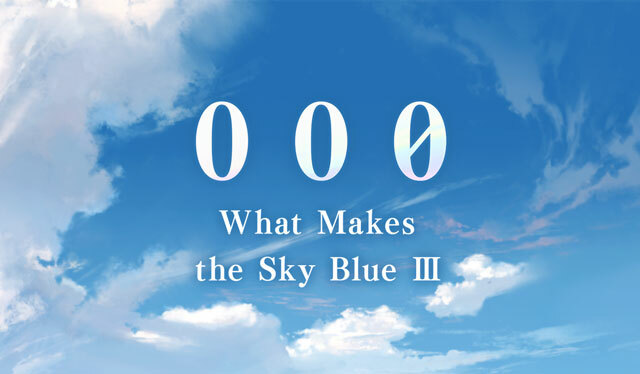 What Makes the Sky Blue III: 000 is a story event which also commemorates the 5th Birthday of Granblue Fantasy. According to the voiced trailer, 000 is pronounced "triple zero." This page contains major event story spoilers. Continue reading at your own discretion. 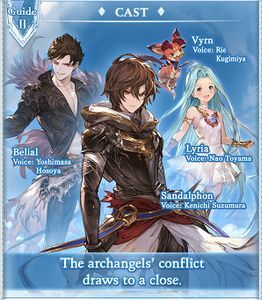 This event is part of the Archangel Saga. 1.2 "Which Atma Weapon should I get?" Their intertwining fates converge toward terminus. Hear the wails from the abode of the damned. to where an ancient tower keeps vigil. whether the blue sky survives or burns. 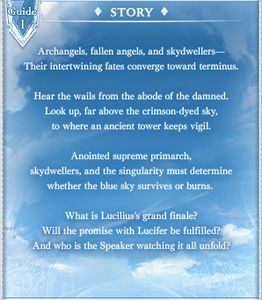 What is Lucilius's grand finale? Will the promise with Lucifer be fulfilled? And who is the Speaker watching it all unfold? as you reasonably can from badge, honor, and token rewards. Farm at least 70× Gold Badge for the Silver Centrum, a somewhat rare item used to unlock Row IV Classes and forge High Level weapons. 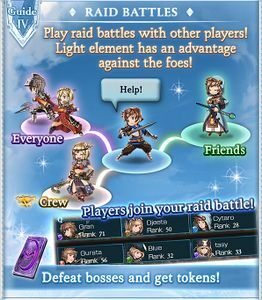 In this type of story event, Very Hard (Solo), Extreme (Solo), and Maniac are intended to be cleared once for their first-time clear rewards. The Solo battles are less efficient than Raids for farming honor, badges, and tokens. Note that this is not applicable to all event types. 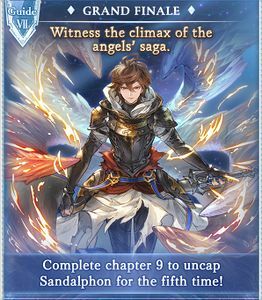 White Plume is used to uncap Sandalphon (Event) to 5★. It is only obtainable from this event. "Which Atma Weapon should I get?" 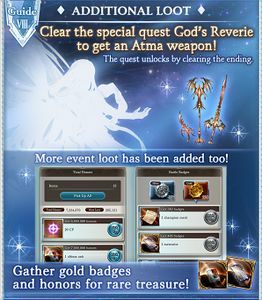 Just like the previous events, all players have a chance to trade in for a free Atma Weapon upon completing the God's Reverie special chapter. 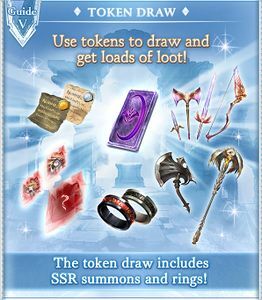 These weapons provide a substantial amount of stat bonuses, not unlike the Bahamut Weapons provided in the What Makes the Sky Blue side story. 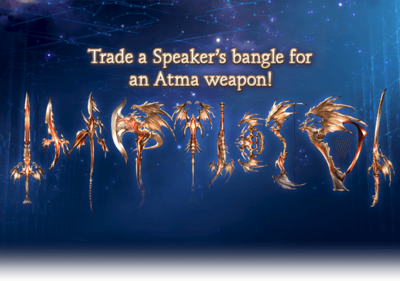 Unlike Bahamut Weapons however, Atma Weapons take into consideration the weapon proficiencies of the classes and characters rather than their race. In addition, players may choose a specific element for the weapon. These weapons can also be upgraded by using Gauph Keys for better stat bonuses of their choice. Gauph Keys are obtained by trading Meteorite ×5, with three of them being available in the event rewards. In general, picking an Atma Sword is the most ideal choice for most parties, due to the abundance of sword-proficient characters and popularity of sword-based classes, such as Dark Fencer and Holy Saber. However, players are also advised to check the weapon proficiencies of their characters. Ideally, choose a weapon based on characters (including the main character) with at least three similar proficiencies. If a class or character has two proficiencies, they will be affected by the weapon regardless of what they're currently using as their main hand weapon. Choosing the element of the weapon relies solely if you want to use it as a main hand weapon. Atma Weapons make excellent main hands due to their ability to buff the entire team upon using a charge attack. Said buff increases the Elemental ATK of the party, the element of which is dependent on the element of the weapon. However, if the weapon is merely placed in the grid and not used as a main hand weapon, then the element of the weapon does not hinder parties of other elements. With that said, all players, new or old, are highly recommended to obtain the free Atma Weapon which also means a free Ultima Core. Because Ultima Cores are normally limited to 4 per account, obtaining the Atma Weapon via the event increases it to 5, giving more players more flexibility in their party lineups. 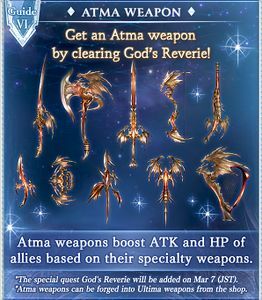 If players cannot decide on an Atma Weapon on or before March 30, 2019 JST, just pick any weapon provided God's Reverie was completed beforehand. Because Ultima Cores can be re-obtained by reducing the weapon, players can simply craft a new one from scratch should they finally decide on the weapon to choose from. have a 4/6 turn uptime. Duration: 3 turns for the party. Stronger in long fights; requires multiple Charge Attacks to reach full effectiveness. is a permanent damage and healing increase for the duration of that fight. 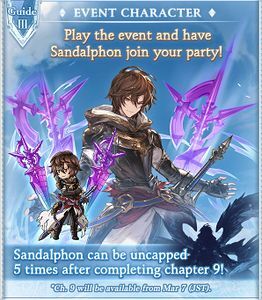 Sandalphon (Event) joins you after viewing the event's opening cutscene. Maniac Solo 1-? 2-? 1-? Nightmare Solo 2-? 4-? 3-? Cost to Host: 0 AP Unlock: May appear after hosting Very Hard (Raid), Extreme (Raid) or Impossible. Does not appear by clearing solo quests. Multi-hit Drk damage to random allies. On the next turn, it'll have 1 turns remaining. on all allies. On the next turn, it'll have 2 turns remaining. on one ally. Dark damage to one ally and removes 5Verification needed. buffs. Drop table last updated: 2018-04-04, all stated drop rates are estimates. On the next turn, it'll have 3 turns remaining. on one ally. the fallen angels must be annihilated. But the power of that pair is a threat unlike any other. Hey, red dragon, how long are you going to rest on my head? We're having a serious discussion here, and you're making me look foolish. Hey, Girl in Blue! Don't you dare read that note! No, it's nothing... I mean, there's nothing wrong with me writing a poem! What did I ever do to you two? You two really throw me off my stride. Heh, days as lively as these are new to me. This text only appears in the voiced trailer pop-up window. Anointed supreme primarch, skydwellers, and the singularity must determine whether the blue sky survives or burns. The final act of the archangel saga begins. This page was last modified on 4 April 2019, at 01:03.